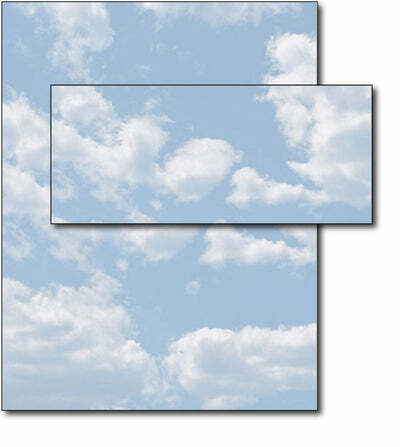 Clouds Leaves Stationery & Matching Envelopes Combo Pack is great for any occasion. This product features everything you need to write letters, invitations, and well wishes to friends & family during any time of year. These stationery & envelopes are made from a quality 50lb Text paper that is inkjet & laser printer compatible. The envelopes are gummed for easy sealing. The Stationery measures the standard US Letter size of 8 1/2" x 11" making it easy to use with any software. Envelopes are the standard #10 size of 4 1/8" x 9 1/2".